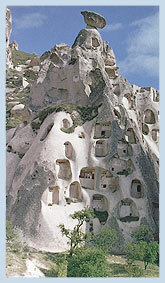 Cappadocia is the area surrounded by volcanic structures which spreader their deposits here throughout the millenniums. After the volcanic convulsion atmospheric movements caused the formation of dense and intricate patterns of valleys, ravines and gullies which were diversified by a variety of individual features like rock cleft and cavities, free standing stacks and isolated pinnacles known as "fairy chimneys" . The Hittite sources indicate the existence of the region in the 2300 BC.. In the Roman era the province became a center of Christian theology. In the forth century prominent theologians made significant contributions to Christianity in the carved caves, monasteries and underground shelters. With its lunar landscape scenes and nice hotels Cappadocia is considered one of the most attractive sights of Turkey. Unique formation of the Cappadocia region is like a natural play ground. We believe adding some creativity to natural offers of the area will make Cappadocia number one incentive destination. Ballooning: Floating serenely above the spectacular volcanic landscape ends up with a Champagne Brunch. Horse Back Riding: Touring the area by horses will give a different perspective to the visitors. Tours are colored by shock suppresses. 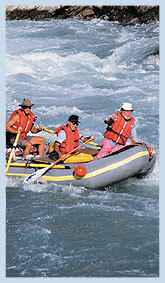 Rafting: After a short drive from the region it will be an adventurous experience. Village Wedding: Being invited to the folkloric wedding in a typical village and tasting the local food, is the best way to understand the local life style. Concert in Zelve: Due to the choice, a classical or a jazz music concert in this unique valley is a great feeling. Lunch in a village House: Turkish people are famous with hospitality, the best way to find that is a lunch in a typical village house where the owners of the house serves. 1) Pottery Atelier Party: Pottery making is an old tradition in Avanos. These ateliers are mostly in caves, learning pottery making and tasting the local wine is fun. 2) Rug Weaving Atelier Party: Rug weaving is one of the main income in the area. A party in a place where is full of looms and rugs with suppresses. Turkish Night in a Cave: In Cappadocia there are several night clubs carved into caves. They are famous with folkloric dancing, food and local wine. Bird Watching: Two hours drive from the region is an important bird watching area where you can watch flamingos.